Vincent (Jesse Eisenberg) and Anton Zalesky (Alexander Skarsgård) are cousins who hatch a scheme to make money by drilling a four inch wide tunnel running fiber optic cables from Kansas to New York that will speed up transactions on the Stock Exchange by a millisecond, but they face a series of roadblocks, including their ex-boss (Salma Hayek). The latest from Canadian filmmaker Kim Nguyen, The Hummingbird Project is a flawed but mildly entertaining dramedy. The film feels too long at nearly two hours, and plays with an odd mashup of tones that doesn’t always mesh, but it still has its moments and the emotional payoff at the end mostly works. 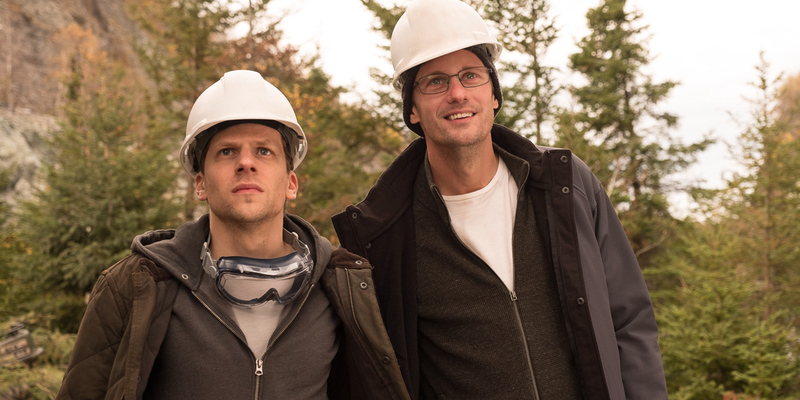 Jesse Eisenberg is appealing as a fast-talking huckster, and Alexander Skarsgård is almost unrecognizable as a jittery, balding coding nerd.